I don’t know how long people have thought about modifying Remington 870 shotguns to accept detachable box mags, but a few years ago at the 295 Tactical Range in Eugene, Oregon I got to try one. I was excited because I loved the idea from the first time I saw the gun on Instagram. Sadly, it didn’t run very well. And I’m not the only person to conclude that. It turns out that modifying the 870 to reliably feed from a detachable box magazine was harder than it seemed. 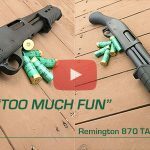 I’m happy to say it looks like Remington has nailed it with the introduction of the 870 DM. In my own experience, it seems that when asked what the most reliable shotgun is most people would say the Remington 870 (no offense to Mossberg 590 fans intended). Without a doubt, the 870 remains one of the most highly respected Law Enforcement shotguns nationwide. That makes it the ideal gun to modify for detachable mags. Benefits to the box magazine fed Remington 870 DM are numerous. If you own a typical shotgun, you know the drill. When you exhaust your ammo, you pause to reload – one shell at a time. I know I’m not that quick at the process. I’ve seen three gun competitors use a number of different tricks to load more than one round at a time and I’m entirely unqualified to asses that. Except maybe to say that feeding a typical magazine fed AR or similar rifle seems simpler and easier to deal with. Just my opinion, put yours in the comments below. In contrast to your typical shotgun, imagine a beefy magazine holding six rounds of 12 gauge ammo. Two and three quarters inches or three, or mix and match. That’s what I did for my test. For years I’ve kept a half full box of random leftover live shotgun ammo from whatever I was doing. Probably not the best practice for hunting, gun games, defense, whatever, but just fine for shooting for fun and this test. Watermelons don’t care if they’re hit by buckshot or birdshot. Jugs of pineapple juice may care. I got sprayed by one… You’ll see in the video. Slugs were in my mix as well. First, the 870 DM ran like a sewing machine. In spite of my schizophrenic mix of shells, every time I’d run the pump the shotgun seemed happy as a six month old Labrador Retriever who just got a new ball to play with. Can guns be happy? Probably not, but I was as the 870 DM digested with ease everything I fed it. Secondly, the mags loaded into the gun nicely, open bolt or closed. You don’t rock the magazine in, you align it and push. I was able to confirm the mag locked into the gun both using the beer can grasp and slapping/tugging its base. You’ll see both in the video. I could use more practice and muscle memory to get faster at it, but it works like you’d hope it would. Third, stripping the mag is a piece of cake. Bear can grasp where your index finger grabs the mag release. Squeeze with your index finger and pull. Essentially, it’s one smooth motion and reminds me of my original Tavor SAR release. My mags don’t drop free and given the design I doubt they are supposed to. Fourth, loading the mag proved the most complicated part of the process for me. It’s not that it’s hard. It’s technique that matters and someone may have discovered a better one than I did. I found that if I pushed the shell down, compressing the follower, then back, it worked consistently for me. The brass rim of the top shell has to slide over the brass of the shell beneath it. For high brass shells it’s easier. In any event, I can load the mag about as fast as I can load a typical tubular magazine shotgun. But then again, I can load several 870 DM mags and be set for much faster reloads when called upon. Now the fifth thing learned falls into the category of one of those serendipitous discoveries you stumble upon from time to time. How much fun is it to unload a typical pump or semi-auto shotgun? Not a lot in my experience. Run the action back and forth until empty. Not a big deal, but more than a handful of accidents have resulted from people not quite getting the process right. Probably more common is annoyance. I was just Pheasant hunting in Kansas where they have no magazine limit while hunting upland birds. So guys load up, tactical reload when needed, then return to guides’ trucks where they unload, one single shell at a time. With the Remington 870 DM, you just pull the pump back, strip your mag and you’re done. There are five other variations of the 870 DM including a wooden stocked one. The Magpul MSRP is $799 while the 870 DM Hardwood is only $529. There’s even a TAC-14 model at $559. If you never need or want more than two rounds in your shotgun, your over/under will suit you well. I might even ask to shoot it should we end up shooting or hunting together. And while I’ve historically been an auto loader fan (in fact my first gun purchase ever was a Remington 1100 when I was a teen), it sure is fun running this pump shotgun! And if it came down to reliability for something serious like home defense, I’d take this 870 DM over my autoloaders. Now it’s your turn. Enjoy the video and then share your thoughts in comments below. This entry was posted in Special Hunting Weapons & Tactics™ - The Center of Gravity for Tactical and Long Range Hunting and tagged 870 DM, Remington, Remington 870, Review, shotgun, Tactical by Jonathan Owen. Bookmark the permalink. Loved the video. I am going to get that Magpul version for myself!! Perhaps the Tac14 version also. Now that it holds 7 shots, there is really no longer an advantage to the Mossberg Shockwave. Is the tube below the barrel still a magazine? Meaning is the gun a detachable magazine only function? The Tube is no longer a magazine. It is blocked so that only the box mag functions as a magazine. Great question, and given that CA seems to change the laws once a week, I’m not sure. Based on what I’ve read, it should, but that could be wrong next week. Lived there briefly, geographically it is amazing, but the gun law specifics are beyond me. Can you convert a Remington model 1100 using this type of magazine? At this time there are no conversion kits for anything. It’s the 870 DM or nothing. Like you, I wonder what the future holds, though. How in he’ll have I missed this evolution of my beloved 870s??? The title is apt, the holy grail. I’m on the hunt now. And, the magpul version is just sick. I e always had a thing for their 870 furniture anyway and with that “stick” sticking out the bottom…… yes, my holy grail at least. Why, oh why did they disable the tube? Eleven is, still, even better than seven!!! Come on Remington…..have it feed box mag first, then when empty, switch to tube, automatically…..or manually would be cool too! Any way to “unblock” the tube and make it functional? No way to unblock. Square peg, round hole. Remington needs to make a new version of the 878 Automaster with this magazine.